Russian Hebraist; born at Keidani, government of Kovno, Jan. 1, 1840. 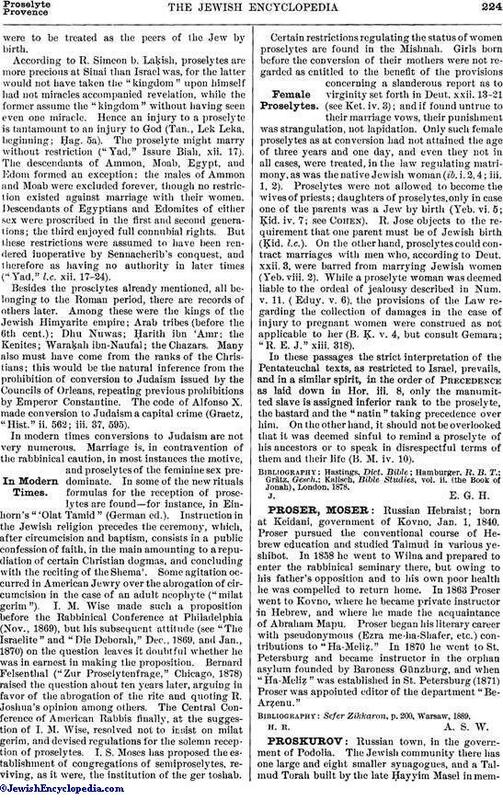 Proser pursued the conventional course of Hebrew education and studied Talmud in various yeshibot. In 1858 he went to Wilna and prepared to enter the rabbinical seminary there, but owing to his father's opposition and to his own poor health he was compelled to return home. In 1863 Proser went to Kovno, where he became private instructor in Hebrew, and where he made the acquaintance of Abraham Mapu. Proser began his literary career with pseudonymous (Ezra me-ha-Shafer, etc.) contributions to "Ha-Meliẓ." In 1870 he went to St. Petersburg and became instructor in the orphan asylum founded by Baroness Günzburg, and when "Ha-Meliẓ" was established in St. Petersburg (1871) Proser was appointed editor of the department "Be-Arẓenu." Sefer Zikkaron, p. 200, Warsaw, 1889.